Sign Up For Traders’ Resource! Traders’ Resource is online now! To include your product or service in this ultimate technical trading guide, sign up here. The information you provide will become part of our online Traders’ Resource. No longer will the resource be limited to just software products. Additional categories include: data services, online trading services, courses/seminars, trading systems, publications, and more! Interested customers will be able to link to your own Website or fill out a form requesting additional product information. In addition, the information will be published annually in an issue of our magazine, Technical Analysis of STOCKS & COMMODITIES. 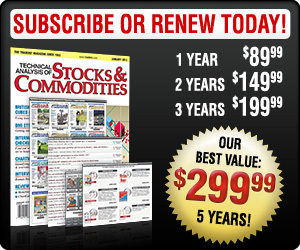 Traders who need your product or service will turn to STOCKS & COMMODITIES or Traders.com when they’re ready to buy. Your listing in Traders’ Resource will generate leads. Create awareness! Whether you’re new or long-established, there’s always a new customer out there for you to impress. Get instant leads! Visitors to Traders’ Resource at Traders.com will complete a form asking for additional information. We’ll E-mail that request to you instantly... at no cost to you! Cut through the clutter! Submit your Website to Traders’ Resource... our search engine will refer browsers only to sites listed with us. Still at no cost to you! Let your customers compare! Comparison tables for every category will be published regularly in the pages of Technical Analysis of STOCKS & COMMODITIES. Enhance the leads you’re already getting through S&C advertising... FREE! Generate leads even if you’re not already advertising in S&C... FREE! Generate leads all year long... FREE! Update your information when you need to, any time of year... FREE! Reach 100,000 traders a month... FREE! Web browser (any browser capable of accepting cookies). Recent sales and marketing information. Need help? We’re an E-mail away at Survey@Traders.com. Which magazine issue(s) will your category be hilighted in (general guide, subject to change)? New categories and questions will be added continuously to give you a chance for even more free exposure! Don’t delay — sign up today! The earlier you submit your information, the sooner you’ll start to receive new customers.